I have discovered online a very interesting classic journal article about Aztec autosacrifice by the esteemed Dr. Zelia Nuttall. Written in 1904, it lacks the benefits of recent scholarship, but it still remains a keystone work in understanding the specific form of autosacrifice that is bloodletting from the ears. Dr. Nuttall provides detailed description and discussion of the various specific forms of ear sacrifice, accompanied by extensive translation from numerous codices and photographs of pictorial depictions of this type of penance. If you are interested in learning more about how the Aztecs traditionally performed ear sacrifice, I strongly recommend following the link to read the article. Even better, as it is in the public domain, the full text is available to download as a PDF through Google Books! Click here to go read “A Penitential Rite of the Ancient Mexicans” by Dr. Zelia Nuttall! Some highlights of this article are discussions of the close association of ear autosacrifice with the gods Tezcatlipoca, Mixcoatl, Huitzilopochtli, and Quetzalcoatl. Of particular interest during this veintana of Quecholli is the description of a special type of autosacrifice attributed to Mixcoatl, the God of the Hunt. The article includes several forms of ear sacrifice linked to specific veintanas, including Quecholli and Panquetzaliztli. Additionally, it describes a sacrifice offered on the day Nahui Ollin, the daysign of the current Sun, the Sun Four Movement. Also interesting is Dr. Nuttall’s analysis of the jaguar/ocelot imagery surrounding Tezcatlipoca and his connection to the constellation Citlal-Xonecuilli, which is known today as either Ursa Major or Minor (a little help on which one, Shock?). [Edit — It’s Ursa Major. Thanks, Shock!] 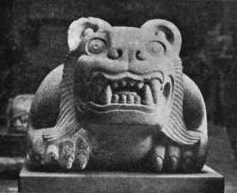 Instead of a bear, the Aztecs saw the constellation as a jaguar and a symbol of Tezcatlipoca. It reminded them of the time when Tezcatlipoca, acting as the First Sun, was chased from the sky by Quetzalcoatl and descended to Earth in the form of a great jaguar to devour the giants, the first people. That is why the constellation seems to swoop from its peak in the sky down to the horizon, reenacting this myth every day in the night sky. My only irritation with this article is a few points where the good doctor strays from proper anthropological neutrality to make disparaging comments about the practice of autosacrifice, and to congratulate the Spaniards on stamping it out. I’ll admit it, I do derive a certain sly pleasure in discussing it here so that it’s not forgotten!